As you research your family in America, the major events in American history can be very important to know. One event may not often be thought of was when the first captive Africans came to the English American colonies. Not only you may have had an ancestor among those early African slaves or maybe an ancestor who owned the slaves. 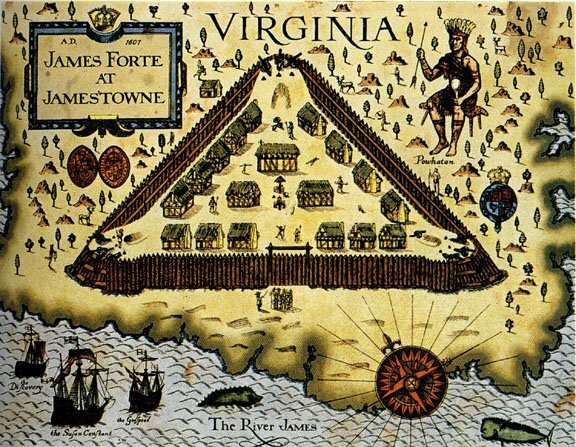 This year – 2019 – does mark the quadricentennial (400th) anniversary of the first arrival in 1619 of captured Africans who were brought to the English colony of Jamestown and first lived in the settlement of Point Comfort (the Virginia colony). In tribute to this fateful arrival, a “400 Years of African American History Commission” Federal Commission has been created by U. S. Congress and signed into law. On December 6, 1606, the journey to Virginia began on three ships: the Susan Constant, the Godspeed, and the Discovery. In early 1607, there were 104 English men and boys who arrived in North America to start a settlement. 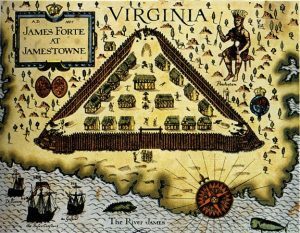 On May 13, they picked Jamestown Island, Virginia up the James River, for their settlement, which was named after their King, James I. The settlement became the first permanent English settlement in North America. For protection, the first structure constructed was Fort James. 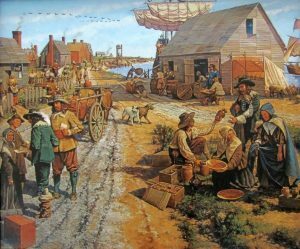 In 1619, the Virginia Company recruited and shipped over about 90 women to become wives and start families in Virginia, something needed to establish a permanent colony. Over one hundred women, who brought or started families, had arrived in prior years, but 1619 was when establishing families became a primary focus. Early English colonies did not immediately enslave the Native American Indians when they arrived at Jamestown, nor did they bring slaves from Africa in the first few years. Slavery was a familiar institution to the English, but in the 1600’s nearly all labor in England consisted of free workers. The start of having Africans in Jamestown was when two English pirate ships, the White Lion and the Treasurer, both sailing out of the Netherlands intercepted in July 1619 a Portuguese ship, São João Bautista, in the Gulf of Mexico, then transported the captured Africans to Jamestown. The Portuguese ship had acquired a cargo of slaves in Angola, and originally planned to sell them to the Spanish in Mexico. The English pirates stole about fifty slaves, then sailed to Virginia with the intention of selling them. It was late August 1619 when the White Lion ship arrived at Point Comfort, sold 20 or so Africans – with payment in the form of food. Four days later, the Treasurer arrived and sold an unknown number of its slaves. The story continues with Part 2 on January 29th blog.